CK Repair Clamps and Couplings - CASCADE PLC - The new home of Cascade Clamps UK Ltd, Suppliers and Manufacturers of pipe fittings to the water & gas industry. The Cascade CK Repair Coupling Range are a line of fittings for the repair and joining of most common pipe materials. These fittings have higher pressure ratings than our standard repairs and can also be used for hot water. 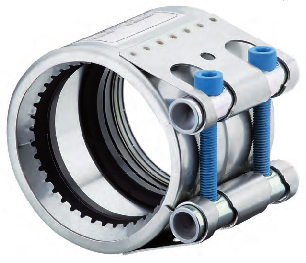 The CK-REP E are non restraint repair couplings, they are used to connect and/or seal metal and plastic pipes. Due to their design they allow a quick and easy repair to be carried out, without the need of dismantling the pipes. Download the data sheet below. ​Strip insert protects the sealing sleeve from increased mechanical and chemical loads. It also prevents moisture expansion and allows for larger gaps between the pipe ends to be connected. furthermore it allows for large angular deflection and pipe misalignment. The double lip sealing system provides a highly reliable seal. This is achieved by the two interlocking gaskets being pulled together when torquing the bolts. This also means that when internal pressure increases the sealing lips push firmer against the pipe forming an even tighter seal. 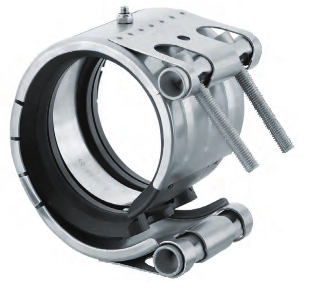 The CK-GRIP / GRIP E is an axial restraint coupling used for the joining of metal pipes (Steel, Stainless Steel or Cast Iron). The conically stamped teeth indent into the metal pipes surface, providing safe and strong axial restraint. Owing to its design it can even withstand high vibration loads. Anchoring ring with conically stamped teeth. The CK Combi GRIP & GRIP E are for connecting plastic pipes to metal pipes. One side of the coupling features special anchoring ring with flat teeth, which are pressed into the plastic pipe without damaging the pipe. On the other side a set of conically stamped teeth to bite on to steel pipe.